I rarely read war novels. I just can’t deal with the emotions. Normally by the end of the novel, I would be in tears. However, something caught my eye with this one. It is a possibility that it was the front cover, a young girl dancing with death himself. The Book Thief is an interesting read, set during World War II. I say ‘interesting’, due to the fact that the novel is narrated by death. You will be needing tissues with this one. But it’s definitely a good read that I would recommend. 1939 Nazi Germany. The country is holding its breath. Death has never been busier. Liesel, a nine-year-old girl, is living with a foster family on Himmel Street. Her parents have been taken away to a concentration camp. Liesel steals books. This is her story and the story of the inhabitants of her street when the bombs began to fall. Mere Christianity is a collection of Lewis’ radio talks while he was in the British Military. His talks focused on defending and explaining Christianity, while keeping it very easy to relate to, and understand. The tone and wording used is very simple, yet very philosophical. Even if you don’t follow or believe in Christianity, this is a wonderful book to get a thorough idea of what Christianity is. What to read? What to read? I’m asking myself this question all the time. Then, out of the blue, I find the answer. On Facebook, of all places. 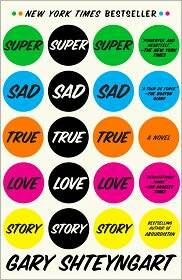 A friend asked for some literary fiction suggestions and her friend suggested Super Sad True Love Story by Gary Shteyngart. “Suggested” is putting it mildly. She insisted, emphatically. So, at the risk of being disappointed because of too high expectations, I’m giving it a go. Normally, I would only suggest a book I’ve actually read. However, I thought it’d be fun to suggest a book we might read together. Then, when I post my review, you can yell at me, praise me, or dismiss my opinion entirely and never read another book I suggest again. Either way, we get a little conversation going and I don’t have to feel guilty for neglecting We Heart Reading anymore. You’ll have plenty of time to read it before I get finished, I’m sure. Reading time is a luxury these days. So, who’s up for a little book discussion?